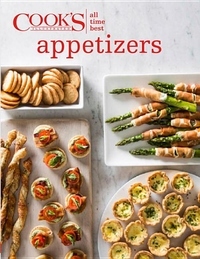 Hosting a party is overwhelming enough; let the experts at Cook's Illustrated reduce some of the strain with this perfectly curated selection of "only the best": the 75 best appetizer recipes ever to come out of the test kitchen. An innovative organization makes it simple to put together a well-balanced spread that hits all the high points, from something dippable to snacks to munch by the handful to elegant two-bite treats. Chapters mix cocktail party classics and modern finger foods and satisfy a variety of menus, abilities, and styles. Invite Cook's Illustrated to your next soiree to guarantee the all-time best party for you and your guests.